Worst Case Scenario: Weapon Jam! It happens. Weapons jam no matter how sophisticated or primitive. Even a club can break. Frankly, the more moving parts in a weapon system, the greater the chance that something will fail—particularly in the rugged demands of the battlefield. Let’s be clear here. A weapon may fail for many reasons. It might be out of ammunition, air, or batteries. It might have experienced a double-feed or some similar malfunction. Most of these failures are not catastrophic. They’re fixed quickly through a simple drill that is learned as part of the warrior field craft. But what happens when a weapon fails catastrophically? What is the best course of action? A bit embarrassed and with a sheepish grin the troop typically resigns to the situation and walks off the field, upright and seemingly oblivious to the projectiles whipping about his head. Okay, for sake of posterity—don’t do this! Let this be the first rule of a weapon jam. Don’t leave the battlefield. We could add to that rule by saying that standing up in middle of a BB storm is generally a bad idea, too. But why not leave? The weapon system is useless. Ah true, grasshopper. But you are not useless. First, look at this situation from the opponent’s perspective. It’s simple mathematics. If your opponent has six troops to contend with, and one of them gets up and walks away, that opponent now has only five troops with which to contend. You’ve made it easier on the bad guys by abandoning your team. And you’re not going to win popularity points like that! Remember that your opponent is likely unaware of your weapon jam. By simply moving with your team you are continuing to complicate the enemy’s situation. Second, consider your leader’s perspective. When high-speed projectiles are zinging about the field, most troops head right for the ground. That’s good, but their situational awareness is just as diminished as their view of the battlefield. More sets of eyes on the battlefield are a good thing. Without a functioning weapon, you can still act as a spotter and communicate what you see. This adds to everyone’s situational awareness, most notably for your leader and crew-served weapon teams. Last, consider your combat buddy. What’s that you say? You don’t have an assigned combat buddy? Well, shame on you. Every warrior needs a combat buddy. They keep you out of trouble, and you should do the same for them. When coupled together as combat buddies, the life expectancy of troops in battle is significantly increased. If you experience a catastrophic weapon jam, you should maneuver quickly to your combat buddy to assist in any way you can. 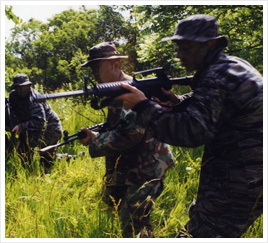 Act as a spotter, fill ammunition magazines, work the radio, or carry burdensome equipment. The point is that you move with your combat buddy not only to help him, but to complicate the situation for the enemy. They will easily pick off your combat buddy if he has to go it alone. So go with him! Will you eventually have to walk off the field to fix your weapon system? Of course. But timing is everything here. First, deal with the battle at hand. Remain focused on the objective and loyal to your team. Do NOT leave the battlefield. Link up immediately with your combat buddy. 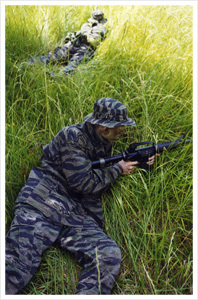 Assume roles as a spotter, radio operator, ammunition re-loader, or pack mule. Keep moving forward with your combat buddy and team members! It’s simple mathematics. Your opponent has no idea your weapon went black and so he still must deal with you. After all, you’re not a casualty—so why go back to the casualty collection point or assembly area? Equally as important is that your combat buddy and team members have multiple tasks they must achieve in the heat of the battle. Your assistance will be welcomed, as will your presence.